This photograph was taken from the Space Shuttle Challenger on 4 May 1985 during STS-51B. North is roughly toward the top. 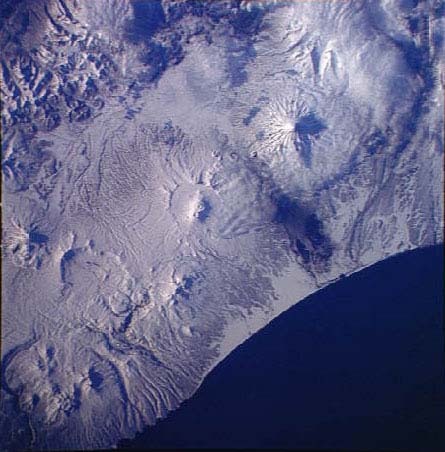 It shows the western portion of Kronotsky National Biosphere Preserve--mostly covered with snow. The red dot in the image below indicates the location of Dolina Geizerov. The yellow dot is centered on Kronotskoye Lake, which is ice-covered in this image. 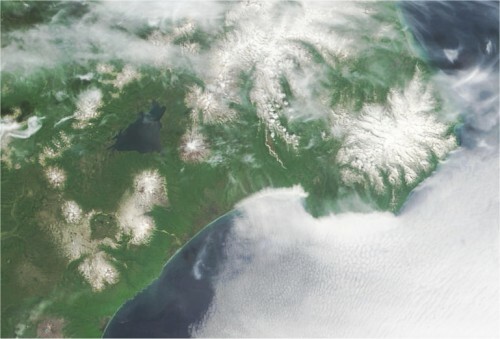 The prominent mountain to the right, indicated by the orange dot, is Kronotskaya Spoka Volcano, rising 3,528 meters above sea level. The photograph below was taken from the Space Shuttle Columbia in the first week of December 1983 during STS-009. North is toward the top, and the Pacific Ocean is at the bottom. The region seen is only partly snow-covered, and Kronotsky Lake (upper right) is nearly free of ice. 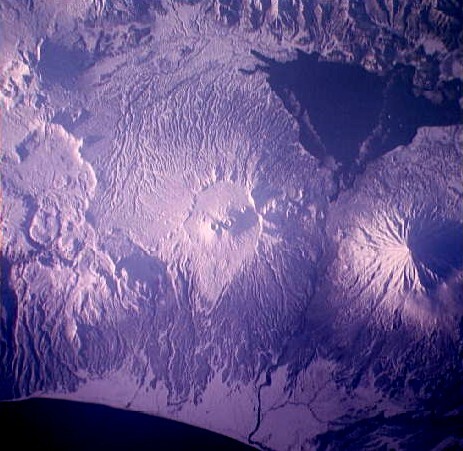 Prominent volcanic features include Kronotskaya Spoka Volcano (right center), Krasheninnikov Volcano within an 8-km diameter caldera (center), and the 11-km diameter caldera associated with Uson Volcano (left center). 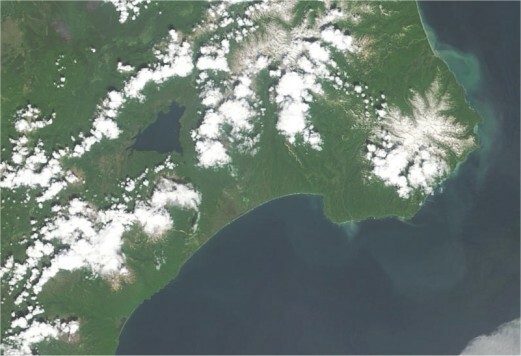 Dolina Geizerov is within the canyon complex just below the Uson Volcano caldera (near left edge of image). text © 2001, 2003 by Wm. Robert Johnston. Last modified 18 April 2003.